Update: strike journey ended already, you can read some details at or via my other blog. As you may know a general strike has been called in the Basque Country and Galicia, and later another parallel one was also called in Spain by different unions. 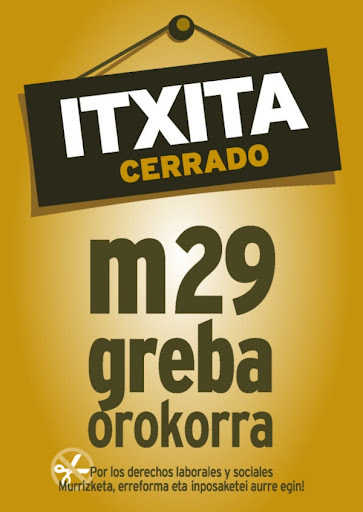 The strike is against the draconian social cuts and the retrograde ultra-capitalist destruction of workers’ rights imposed by the European Union and the International Monetary Fund and implemented by the new ultra-conservative government (which has no significant more support that had when they were opposition a few months ago). Therefore this blog will not be edited in the next 24 hrs. and I will not participate in any discussions. Marc Haber et al., Afghanistan’s Ethnic Groups Share a Y-Chromosomal Heritage Structured by Historical Events. PLoS ONE 2012. Open access. Afghanistan has held a strategic position throughout history. It has been inhabited since the Paleolithic and later became a crossroad for expanding civilizations and empires. Afghanistan’s location, history, and diverse ethnic groups present a unique opportunity to explore how nations and ethnic groups emerged, and how major cultural evolutions and technological developments in human history have influenced modern population structures. 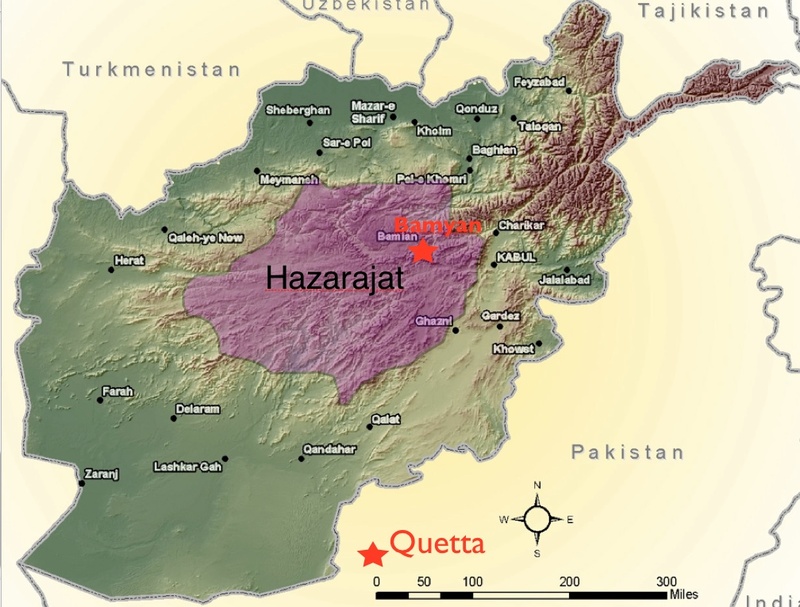 In this study we have analyzed, for the first time, the four major ethnic groups in present-day Afghanistan: Hazara, Pashtun, Tajik, and Uzbek, using 52 binary markers and 19 short tandem repeats on the non-recombinant segment of the Y-chromosome. A total of 204 Afghan samples were investigated along with more than 8,500 samples from surrounding populations important to Afghanistan’s history through migrations and conquests, including Iranians, Greeks, Indians, Middle Easterners, East Europeans, and East Asians. Our results suggest that all current Afghans largely share a heritage derived from a common unstructured ancestral population that could have emerged during the Neolithic revolution and the formation of the first farming communities. Our results also indicate that inter-Afghan differentiation started during the Bronze Age, probably driven by the formation of the first civilizations in the region. 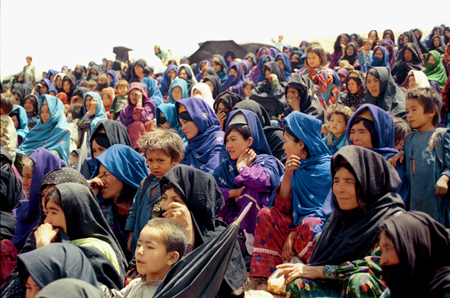 Later migrations and invasions into the region have been assimilated differentially among the ethnic groups, increasing inter-population genetic differences, and giving the Afghans a unique genetic diversity in Central Asia. In my understanding the really interesting stuff is in the supplemental table 4, which lists all the tested haplogroups for the Afghan samples. I must say that what stroke me the most were the three Y-DNA B Hazaras. This is a lineage almost unreported in Eurasia and much less in a population that shows no other signs of African admixture. Supplementary table 1 lists all haplotypes and the three Y-DNA B Hazaras (two from Bamiyan and one from Ghor) have some differences: they are not recent relatives by patrilineage. Whenever the African lineage arrived to the area, it had since then some time to evolve and diverge locally. 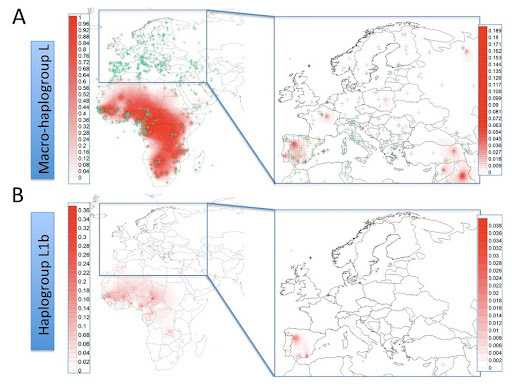 Are we before yet another puzzling Out-of-Africa remnant like the East Asian Y-DNA DE (mostly D)? Or is something more recently arrived? If so, how did it reach such high frequencies among the Hazara (and only them)? The Hazara sample also includes an individual with Y-DNA M1, which is in principle a Melanesian lineage, i.e. another haplogroup which should not be there, but this one from the opposite corner of the Old World. Otherwise it seems evident that Y-DNA R1a1a dominates among Indoeuropean speakers (Pashtun, Tajik and Noristani), C3 among the Uzbek and Hazara and L1a among the Baluch and “Arab” (who seem identical to the Baluch). J2a (maybe a Neolithic layer) is also important among Tayik and Hazaras, while Q is very important among Pashtuns (Q is most basally diverse in West Asia, in case you do not know, even if it is most frequent among Native Americans). The adscription of the Aurignacian techno-culture in Europe to Homo sapiens (alias ‘anatomically modern humans’, or ‘AMH’ or ‘modern humans’ for short) was only indirectly supported, mostly by remains from Palestine (Ahmarian or Ahmiran culture, part of the wider ‘Aurignacoid’ complex of West Eurasia). Recently a jaw from England and some teeth from Italy were also alleged to support very early presence of our species in Europe. However the conclusions were controversial and the findings had, like Oase 1, no direct relation with Aurignacian or other Aurignacoid cultures (in fact the Italian teeth belonged to the Uluzzian, what is a very different debate). Christine Verna et al., The Early Aurignacian human remains from La Quina-Aval (France). Science 2012. Pay per view. There is a dearth of diagnostic human remains securely associated with the Early Aurignacian of western Europe, despite the presence of similarly aged early modern human remains from further east. One small and fragmentary sample of such remains consists of the two partial immature mandibles plus teeth from the Early Aurignacian of La Quina-Aval, Charente, France. The La Quina-Aval 4 mandible exhibits a prominent anterior symphyseal tuber symphyseos on a vertical symphysis and a narrow anterior dental arcade, both features of early modern humans. The dental remains from La Quina-Aval 1 to 4 (a dm1, 2 dm2, a P4 and a P4) are unexceptional in size and present occlusal configurations that combine early modern human features with a few retained ancestral ones. Securely dated to ∼33 ka 14C BP (∼38 ka cal BP), these remains serve to confirm the association of early modern humans with the Early Aurignacian in western Europe. 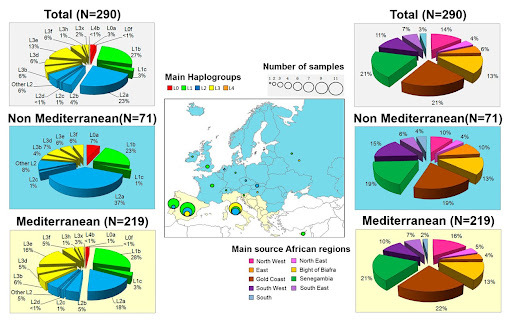 María Cerezo et al., Reconstructing ancient mitochondrial DNA links between Africa and Europe. Genome Research 2012. Pay per view. Mitochondrial DNA (mtDNA) lineages of macro-haplogroup L (excluding the derived L3 branches M and N) represent the majority of the typical sub-Saharan mtDNA variability. In Europe, these mtDNAs account for <1% of the total but, when analyzed at the level of control region, they show no signals of having evolved within the European continent, an observation that is compatible with a recent arrival from the African continent. 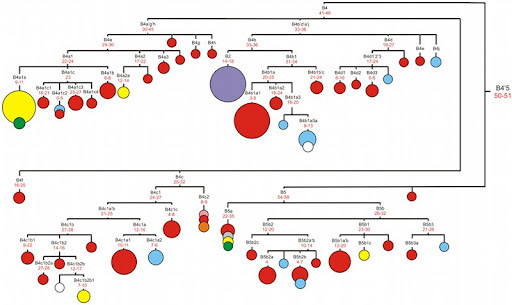 To further evaluate this issue, we analyzed 69 mitochondrial genomes belonging to various L sublineages from a wide range of European populations. Phylogeographic analyses showed that ∼65% of the European L lineages most likely arrived in rather recent historical times, including the Romanization period, the Arab conquest of the Iberian Peninsula and Sicily, and during the period of the Atlantic slave trade. However, the remaining 35% of L mtDNAs form European-specific subclades, revealing that there was gene flow from sub-Saharan Africa toward Europe as early as 11,000 yr ago. See also the press release at Eureka Alert. I do not have access but it seems obvious that the authors are using molecular-clock-o-logy, which is not really reliable, depending on too many assumptions. However they tend to fail towards too recent, so maybe their estimates of 11 Ka can be in fact something like 22 Ka and therefore consistent with the more than likely interactions between SW Europe and NW Africa at the genesis of Oranian culture, which is probably the origin of SW European-derived mtDNA in North Africa. The most common lineages are L1b and L2a. L1b1a11 (Slovenia, Switzerland and Ireland), its sister lineages are found one in Jordan (unnamed) and another (L1b1a3) among Nigerians, Gabonese, African-Americans and some Portuguese. Another very characteristic and also arguably European-specific lineage is L3d1b1a, which is found only in Italy. While the authors do not mention it, I think that Chandler 2005 spotted an L3d2 in Epipaleolithic Portugal (originally reported as “N”). However, using only the HVS region, the exact adscription is always somewhat dubious. Also they performed an Structure analysis (fig. 4) and found that the carriers of the allegedly autochthonous European L lineages displayed very low to zero African affinity (and also near zero East Asian one) while those with the probably recent L lineages had more African and East Asian admixture (East Asian in this case is proxy for Native American most likely, indicating creole origin from America), although the apportions varied from individual to individual. The strength of this test can only be valid for very recent arrivals anyhow, otherwise the African autosomal genetics would be diluted beyond detection in a couple of centuries or so. The authors of this open-access paper surveyed Kazakhs from Altai and Barguts from Inner Mongolia, comparing them with previous data of other nearby peoples and even the distant Iranians. Miroslava Derenko et al., Complete Mitochondrial DNA Analysis of Eastern Eurasian Haplogroups Rarely Found in Populations of Northern Asia and Eastern Europe. PLoS ONE 2012. Open access. The really novel data is of course in the list of mtDNA haplogroups found among these two populations, which is listed in table 1. While Kazakhs have 40% of Western lineages (H, U, J and others), the Barguts only display some 8% (exclusively U and HV clades). The two clusters marked in the PC1-2 graph also appear in the PC2-3 graph, what means that they are very homogeneous in fact. Maybe the Sojots were once Mongol speakers and the Turkic speakers grouped with Evenks and Todjins were once Tungusic speakers, I guess. The also provide some potentially very useful information on haplogroups R9c (including F), N9a, M9, M10, M11 and M13’46’61 (found as singletons in the sampled populations), for which they provide phylogenetic trees in the supplementary materials. R9c1 (the sibling of F) is most common in Philippines (3.3–5.7%) and Abor (11%). Frequencies decay as we move northwards. N9a is most common in Japan (4.6%), Korea (3.9%), China (2.8%) and Mongolia (2.1%), with less important presence in Island SE Asia and Eastern Europe. M10 is a rare East Asian clade with very rare cases in East Europe. M11 is also a rare East Asian clade found from Altai to Japan. M13 has two branches, one (M13a) most diverse in Tibet (and often found in East Asia) while the other one (M13b) is restricted to Malaysian aboriginal peoples. M9 also has two branches: E is found essentially in Island SE Asia and Taiwan aborigines, while M9a’b is apparently also centered in Tibet and scattered through East Asia and Hymalayan parts of South Asia. They propose that M9a1a1 spread to North Asia from South China after the LGM (note: I do not necessarily subscribe this age estimate). They overlap very well, right? I can’t say much more by the moment: the People’s Daily article is too short to discern any further implications. By the age however it is very probable, in my opinion, that it is a former camp of our species, Homo sapiens. The site of Laonainaimiao is at what is described as a scenic spot in the outskirts of the city of Zhengzhou (Henan, China). 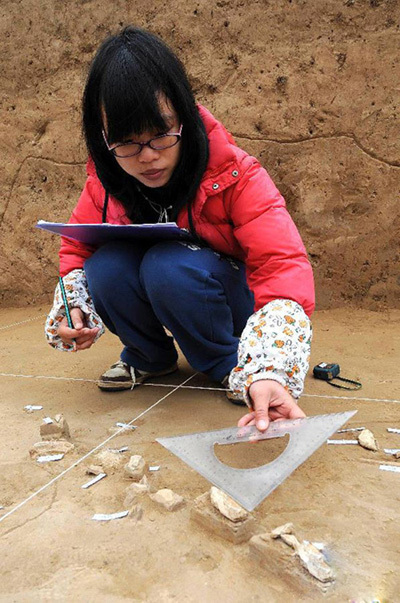 The findings are described as stone artifacts, bone wares, all kinds of animal bones and more than 20 fire relics.